NOTE FOR READERS: While most pharmacologic agents are called out by name, some articles may be overviews of entire classes of agents. 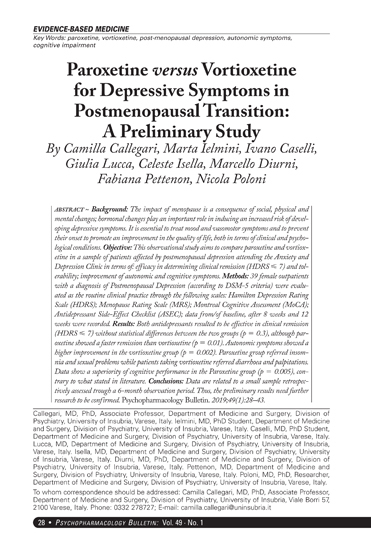 For example, under sections such as ANTIDEPRESSANTS (not specified), the reader would find the following article: Rational Antidepressant Selection: Applying Evidence-Based Medicine to Complex Real-World Patients. Likewise, certain pharmacologic advances can be rationalized only in the context of the disease itself. Among drug categories, you will find ‘non specified’ sections on Epidemiology, Bipolar, and Sleep Disturbances, to name just a few. Rather than omit entire categories of research because they did not correspond to a strict listing of drug names, we chose to deviate in certain instances for the sake of completeness. We hope this does not contribute to any confusion. All articles prefaced with the logo are indexed on PubMed.com under Psychopharmacol Bull. DISCLAIMER: Although every effort has been made to ensure that drug information is presented accurately in all Medworks’ publications, the ultimate responsibility rests with the prescribing physician. Neither the publisher, nor the authors can be held responsible for errors or for any consequences arising from the use of information contained herein. Readers are strongly urged to consult additional relevant primary literature. No claims or endorsements are made for any drug or compound currently under clinical investigation. – Do Long-Acting Injectable Antipsychotics Prevent or Delay Hospital Readmission? – Antipsychotic Induced Symptomatic Hyperprolactinemia: Are Dopamine Agonists Safe? – Does Risperidone Improve Hyperacusia in Children with Autism? – Why Do Persons with Bipolar Disorder Stop Their Medication? Bipolar Affective Disorder: Does Psychosocial Treatment Add To The Efficacy Of Drug Therapy? – Recent-Onset Schizophrenia and Adolescent Cannabis Use: MRI Evidence for Structural Hyperconnectivity? – Rater Training for a Multi-Site, International Clinical Trial: What Mood Symptoms may be most Difficult to Rate? – Developing and Testing Adaptive Treatment Strategies Using Substance-Induced Psychosis as an Example. – What Is a Significant Response in Drug Studies of Attention- Deficit/Hyperactivity Disorder: Statistical Significance Is Necessary, But Is It Sufficient? – Cocaine is a Major Risk Factor for Antipsychotic Induced Akathisia, Parkinsonism and Dyskinesia. – Treatment Resistant Depression With Loss Of Antidepressant Response: Rapid—Acting Antidepressant Action Of Dextromethorphan, A Possible Treatment Bridging Molecule. – Switching to Duloxetine Remits Ziprasidone – Associated Urinary Incontinence and Improves Neuropsychiatric Behavior in Dementia: Possible Relationship of Incontinence to 5HT2 Receptor Blockade. – Hypomania Induced by Escitalopram: 2 Case Reports. – Can Fluoxetine Alone Cause Serotonin Syndrome in Adolescents? – Can Serotonin and Fluoxetine Levels in Plasma and Platelets Predict Clinical Response in Depression? – Does Isotretinoin Cause Depression and Suicide? 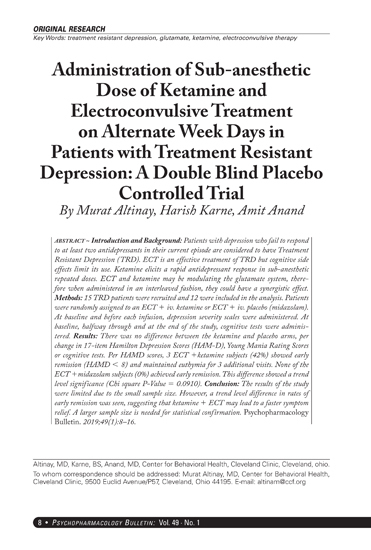 – Lamotrigine Adjunctive Therapy to Lithium and Divalproex in Depressed Patients with Rapid Cycling Bipolar Disorder and a Recent Substance Use Disorder: A 12-week, Double-Blind, Placebo-Controlled Pilot Study. – Revisiting the Effectiveness of Standard Antidepressants in Bipolar Disorder: Are Monoamine Oxidase Inhibitors Superior? Migraine: The Interface Of Psychiatry And Neurology? – Paroxysmal Perceptual Alteration: Drug-Induced Phenomenon or Schizophrenic Psychopathology? – Do Antipsychotic Drugs Influence Suicidal Behavior in Schizophrenia? – Tryptophan Depletion, Serotonin, and Depression: Where Do We Stand? 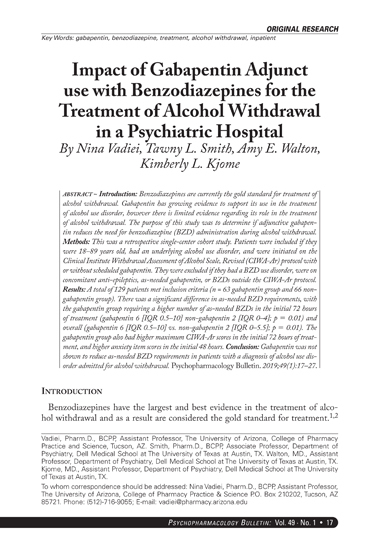 – Ziprasidone Augmentation In An Adolescent With Obsessive Compulsive Disorder: A Case Report.